Here is a step by step guide on how to Create Mobile Coupons through your advertiser dashboard. First, log in to your advertiser dashboard and under ‘Features’, click ‘Mobile Coupons. Here, you can access all coupons. Active coupons will expire once they have reached their end date. Pending coupons are coupons with future start and end dates, and coupons that need your attention are coupons that have been screened and rejected or were not fully completed. To create a Mobile Coupon, click ‘Create New’. You will be taken to the coupon creation wizard. First, you will be asked to choose a coupon type. Our template is a quick and easy way to create a visual coupon to be displayed on the mobile device. An image coupon will use an image you upload as the coupon itself with the expiration date and name of the coupon. You may either upload an image that is 420x200 pixels or select a preloaded image from our gallery. Now, input the name for your product or service. Next, select your coupons colors. Click on where it says "Select". When you hit select, the color slider will appear (below. Choose your color, and remember to adjust the slider on the right hand side to make your color appear in a darker or lighter shade. Finally, input your product slogan. You can select which image you would like to use. Click browse to find your file on your computer. Once you choose your image, the picture should automatically upload and appear on your coupon preview to the right. If you have no image, you can click on "Select From Gallery" to browse our gallery of thumbnail images. From there, input your discount, as well as the start and end date of your program. The next set of parameters create tap to call buttons, button to your website and sharing buttons. Click on "Enable Sharing" to enable customers to share the offer with friends via SMS text (The green button) to social media ranging from Twitter (middle) and Facebook (end). Click ‘Next’ to continue to the next page of the wizard. You can input the address of where the coupon needs to be redeemed. Also, specify your terms and conditions. You could enter in something like ‘Offer only valid until 12/31/2012 and with purchases over $20.00.’ Indicate the address and telephone number of the business in the following field to assure that the customer where to redeem the coupon. Then, choose a barcode type. This barcode can be scanned into the business’ point of sale system so that once scanned during the transaction, the system will automatically apply the discount. These barcodes can be scanned directly from the customer’s phone. If the business doesn’t use barcodes, you can select the last option ‘Promotion Code’. Enter a number for the code, this number can be anything you want and is used when for instance, the barcode cannot be scanned. In "Notify before Expiration" you can select the number of days before expiration that an alert will be sent to all opted-in mobile numbers that hold this coupon. 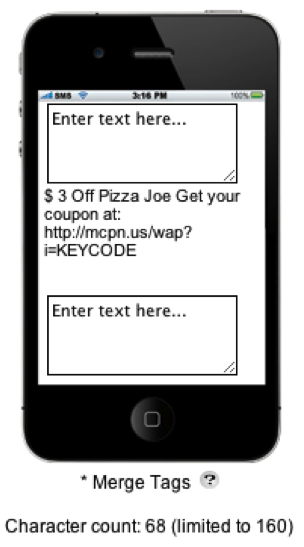 Click on "Enable SMS Redemption" if you would like to allow your customers to redeem their coupons via text messaging. If you do not choose this options, your customers will receiver a link that they will have to click on to get to their coupon. Notice below this is the coupon preview. These images will change as you add information to the coupon, and the preview can be seen on the right hand side of the coupon builder. Click ‘Next’ when finished with this page and you be directed to the last page in the wizard. This page is an overview of the coupon’s details. Click ‘Finish’ when you are all done. A window will pop up asking you to ‘Confirm’, and upon confirming, the coupon will be available to view in the active coupons section if it’s start date is today’s date, or in the pending section if the start date is somewhere in the future. When you are ready to send a coupon out, click the send button for the desired coupon. For the sending options, please refer to the guide on our simple Text Message feature, as the two are pretty much the same. The only differences are that at the top you are given a list of your currently active coupons to select the one you want to send, in which case a preview is available to the right in case you forget which one you wanted. Also, there is also an option to include a custom message before and after the coupon message itself, pictured to the right. You may use merge tags to customize the message. You are limited to 160 characters. Once you create your coupons, utilize them for many purposes. For example, you can use them as an incentive to customers and clients to opt-in to your businesses list. You can also send out a coupon to customers to drive business. For example, if Wednesday night is your slowest night at your restaurant, send out coupons to everyone on your opt-in list to help get people to the restaurant. "Hey, come on in tonight for half off appetizers!"